Download our Book Talk podcast this week as Padma Viswanathan talks to Stephen Usery about her epic novel set in her ancestral homeland of the Tamil-speaking region of southern India. The Toss of a Lemon follows the life of a young Brahmin woman, Sivakami, who is widowed as a teenager, and is forced to live a life of seclusion as dictated by custom, while trying to keep her her family together. Stephen Usery speaks with Tom Andes about the new Voice Of Witness oral history collection Underground America which features narratives from undocumented workers living on the margins of American society. Download the podcast today. 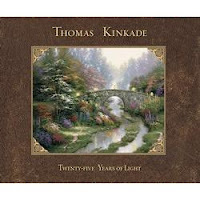 Terri Murphy talks to the best-selling painter in American history, Thomas Kinkade, about his new retrospective Twenty-Five Years of Light. Download the podcast today. Our audio interview with the man GQ magazine calls the best mystery writer in the world, Michael Connelly is now available for download. He and Stephen talk about The Brass Verdict, the book that brings Mickey Haller and Harry Bosch together on the same case. The podcast features an additional 12 minutes of conversation that kept going after the cameras stopped, including where to find the missing chapter 12 from The Brass Verdict. Dowload Blytheville, Arkansas native George Hamilton's podcast interview with Stephen Usery about Hamilton's hilarious new memoir, Don't Mind If I Do. The podcast has a bonus story about Moss Hart and Kitty Carlisle unavailable in the video interview! Book Talk Video - George Hamilton from stephen usery on Vimeo. Come back in a couple of weeks for the audio podcast with a bonus story about Moss Hart and Kitty Carlisle!